Judging by the fact that you are reading this review on my WordPress blog I think it goes without saying that I am a big fan of WordPress. WordPress is great, and honestly my entire business centers around my WordPress site. Also it seems that other people agree with me when I sing WordPress’s praises because just over 30% of all the websites on the internet use WordPress. Yea, that’s a lot of sites! Because I personally use WordPress I often teach my followers and those that wish to duplicate my 7 figure per year business success that they to should have their own website. But this suggestion inevitably leads to one super common question: “What theme should I use?”. Honestly this is a question that is so common, and often so frustrating to answer, that my business partner Mike and I have a running joke for almost two years now where every once in a while (and often in private messages when we do live webinars) one of us will ask the other “Hey what theme should I use on my site?”. Well today I have a definite answer: “UltraSuite”. Why? Because UltraSuite is a very accurate name for this theme. This theme is more than just a theme it is a complete marketing suite which comes pre-packaged with a ton of professional features that you would normally only be able to get by purchasing additional 3rd party plugins. WordPress is nothing without a good theme (the one that comes with it is not so great so forget that one), and if you are going to invest in a theme you need one that offers the most flexibility and options possible. Why? Because you don’t want to have to buy a different theme for every site you create over the course of your online business. What you really want is one, high quality theme, that is flexible and powerful enough that it is going to suit any needs you have now and likely will have in the future. UltraSuite is an ideal theme to have. It allows you to create great looking sites, but also has really powerful features included so your site can grow with your business without you needing to buy additional add-ons and plugins in the future. Its a great theme, a great value, and considering that its being sold for less than what many less functional themes do I feel comfortable saying its a solid investment. BONUS: There are several bonuses that everyone will get no matter who they pick up UltraSuite from, however thats not good enough for my followers and my subscribers, so I negotiated a special bonus for anyone who picks it up through me. 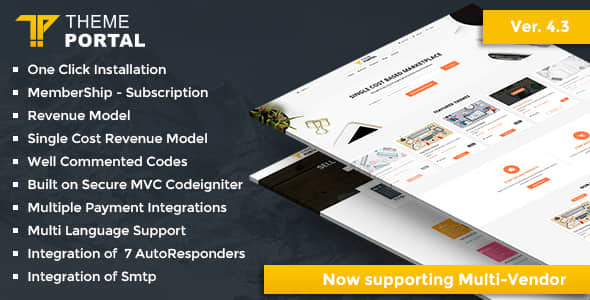 Theme Portal Marketplace , is a script that lets you can easily setup your own digital store If you are looking to sell your WordPress Theme , Plugins , Scripts or any Other Digital Content you can use this script and setup your store in minutes. With this special bonus you can have your own digital store to sell all those things you have collected white label, giveaway, and reseller rights to! No more having them sit on your hard drive collecting dust and being worthless! Click here to get UltraSuite and my special Theme Portal, digital store script bonus! You say it is a theme script. What does that mean? Is it possible to use the ultrasuite theme together with the Theme Portal Marketplace ? If yes, did you test the configuration where they are used together? The sales page seems to imply that it is as good or even better than Clickfunnels. The page lists many things it can do, including building funnels. Is it just hype or would you rate it as something that can be used instead of Clickfunnels?